Home / News / Art, Marketing / How Cool Is the Art Direction on These Ads from Mercedes-Benz? Mercedes-Benz in Mexico has come up with two brilliant print ads to promote their Intelligent Light System that provides 60% more visibility on the road. 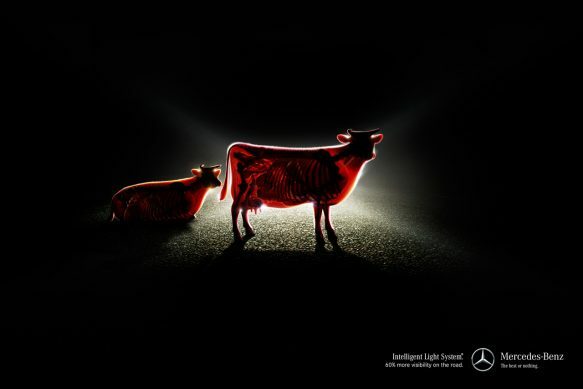 The ads feature silhouettes of a cow and a deer standing in the middle of the road at night. The headlights of the Mercedes behind them are so bright that they create an “X-ray vision” of the insides of the animals. Beautiful, funny and memorable ads that get their point across with a minimum of art. Excellent.